This stunning guitar was an extremely limited edition(approximately 40 pieces) 12 Fret Grand Auditorium body features Macassar Striped Ebony on the back and sides and a shaded Cedar top with Flamed Koa top and back binding and backstrip. The mahogany neck with short scale ebony fingerboard is also bound with flamed koa, slotted headstock with Ebony overlay and pearl Taylor logo with a Macassar Ebony backstrap. 9 volt Expression System electronics. 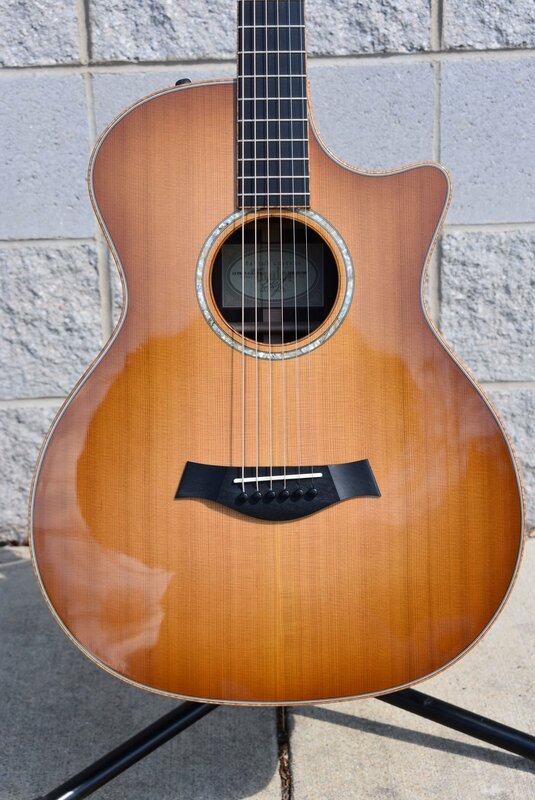 Taylor deluxe hardshell case. This gorgeous instrument is in EXCELLENT CONDITION with only one small ding right under bridge. Minimal fret wear.